Are too many seniors losing control of their credit cards? TransUnion is one of the nation's biggest credit bureaus, and its Aug. 26 press release had a headline that could cheer up the most morose individual: "National credit card delinquency hits lowest level in at least seven years." In other words, the number of people getting into trouble with credit card debt is lower now than it has been since before the credit crunch and recession. And that fall in delinquencies applies across all age groups, with those over 50 years the least likely to have such problems. So far, so good. However, the press release went on to reveal some more worrying data. While average card balances declined between the second quarters of 2013 and 2014 in younger age groups, they actually went up among those over 50 years. That's something new. Last year, the AARP published a report by think tank Demos, and this found that the trend for higher overall card debt among older rather than younger people had arisen since its previous study in 2008. Back then, the opposite had been the case. TransUnion reckons that, in that April-June 2014 period, those in their 50s who had cards owed on average $6,805 on their balances, while the same figure for those 60-plus was $4,891. That compares with $2,135 for the under-30s, and $4,816 for 30-somethings. The Employee Benefit Research Institute's 2014 Retirement Confidence Survey found that 44 percent of retirees were having problems with their debt levels, and 17 percent of them owed more than they did five years earlier. The same study revealed 36 percent (up from 28 percent in 2013) of those still working had saved less than $1,000 for their retirements. That number shoots up to 73 percent among those who say that they and their spouses don't have retirement plans, such as a defined contribution or benefit plan, or an IRA. As many as 34 percent of those age 50+ use their credit cards to pay for basic living expenses because they have no choice, according to Demos. They charge items such as rent, mortgage payments, utilities, groceries and insurance premiums because they lack sufficient funds in their bank accounts to pay those bills. As many as one half had debt related to medical expenses on their cards. They are, in the Demos report's words, "significantly less likely than younger people to run up credit card debt purchasing nonessential goods and services." Time to close the Bank of Mom and Dad? Many elders are finding their finances more challenging because they've helped out others. Nearly one in four (23 percent) say their card balances are higher because they've rescued family members who've had debt problems, according to Demos. The same source points to seniors cosigning credit agreements for younger relatives, sometimes without realizing the obligations and risks such a kindness brings. Meanwhile, a 2012 study by the National Center for Policy Analysis revealed something extraordinary: "The fastest-growing expenditure category for 65-to-74-year-olds is education." On average, that's risen by 14.3 percent annually since 1990. Some of this may be down to elders taking self-improvement courses themselves, and some to their contributing to 529 college plans for their grandkids. But many are also finding themselves on the hook for student loans they co-signed for relations. If you own your home, and have paid off your mortgage (or have only a small balance outstanding), you may, if you're 62 years or older, qualify for a reverse mortgage. This releases some of the equity in your home, and you don't have to make payments to repay the loan. The amount you borrow, plus interest and fees, should be paid off from the proceeds of the sale of your property when you move or die. Think carefully and take independent professional advice before taking this route, because the costs can add up over time. Consider taking a cash-surrender loan against your permanent life insurance policy. You can generally get up to 96 percent of its cash value (the investment portion), and normally shouldn't have to pay this back. But, of course, your heirs are going to benefit less when you eventually die. Talk to a reputable debt counselor (the National Foundation for Credit Counseling maintains a list that could keep you clear of the sharks) about your options. You may be able to agree terms with lenders that reduce your outgoings. 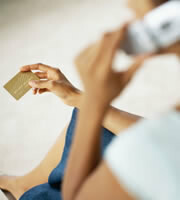 Talk directly to your credit card companies and other lenders. Before you do, draw up a household budget, and work out precisely how much you can afford to pay each. Don't agree to higher payments than you can afford or you risk blowing your credibility when you fail to keep up with your commitments. Most card issuers are likely to do their best to accommodate you, within reason, especially if they can see that the alternative is your defaulting or going bankrupt. With luck, you're going to be able to avoid those nasty alternatives. Retirement isn't easy for many Americans, but chances are you can make yours more comfortable if you act as soon as a problem appears on the horizon. 0 Responses to "Are too many seniors losing control of their credit cards?"